Definitions – What Is Newsjacking? Sounds crass right? Probably because it is. But is it only crass when businesses piggyback bad news stories such as natural disasters? Is it ok to do this around positive events or stories? Is it just smart (or lazy?) marketing? Perhaps, but it is usually the use of it around negative stories that brings it to our attention. 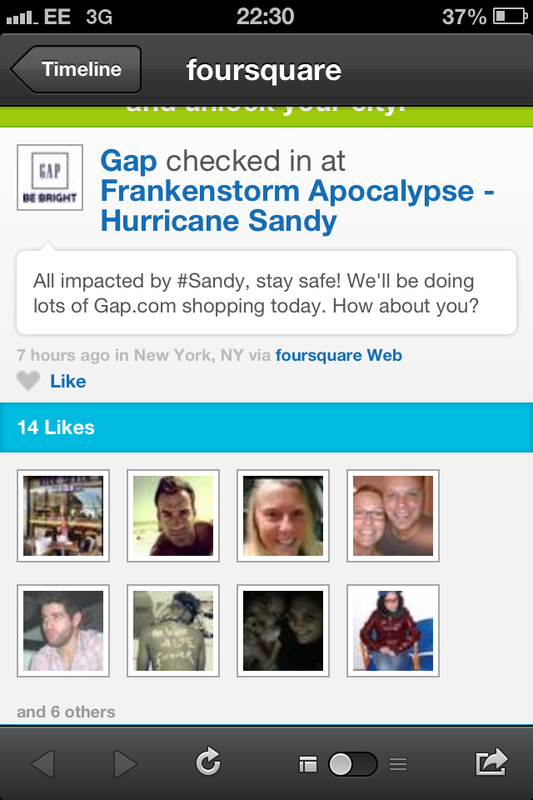 Gap has ‘jacked’ the hashtag #sandy and published their Foursquare check-in to Twitter in an attempt to grab the attention of people that are using the tag to find out vital information about the storm. A stupid move that has caused a pretty major backlash on the social web. You can see the reaction across Twitter here. Clothing companies seem to be eager to anger and alienate consumers this week! 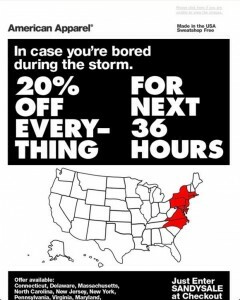 American Apparel sent out this email offering reduced price gear to those living in states effected by Sandy. Again, there has been a web backlash against the brand. You really have to wonder who signs-off on these activities? Bored? I don’t think boredom was top of the list of feelings for people caught up in this storm. Gap and American Apparel now have a PR nightmare on their hands, all down to a lack of thought and a desire to grab some sales. Did they not learn from Kenneth Cole and his Egypt tweet? What Should Brands Do in Times of Emergency? This one is easy – be truly helpful and compassionate. Instead of trying to sell more, why not donate product to those that are in need? Just don’t make a big song and dance about it. Brands like Gap have a huge online audience and should look to harness that in a way that is beneficial to those that need help. Pretty simple, common-sense based stuff really; unfortunately It seems that more and more marketers are struggling to apply a bit of gumption to their work. Should You Ever Use Newsjacking? Apply some brain-power and creativity and you shouldn’t have to. If you must use it, be sure that any activity is based around a positive event, and even then, make sure it is at least related to your brand. How does newsjacking make you feel? Do people take it too seriously? Have you been caught up in Sandy and have an opinion on the actions of Gap etc? Please do comment below. You can also join us on Facebook for examples of great content, opinion, news and more.